Hot springs are a thing of beauty. They’re nature’s gift to humans to encourage relaxation and serenity. Alaska is rich with hot springs for you to enjoy if you know where to find them. Rather than wait to come across one in your Alaska car rental, do your research in advance. Or, let Avis Alaska do the research for you. Here are a few hot springs that Avis has found for you to visit. So hop into your Alaska car rental for one of the most fun and relaxing days of your vacation. Before going further, what exactly are hot springs? If you’ve never seen a hot spring, you may not know exactly what to expect. Hot springs are small bodies of water that are constantly naturally warmed. But how does this occur? The answer is simple – volcanic activity. Who knew volcanoes could benefit people so much? Subterranean volcanic activity heats up the water until the spring becomes as warm as a hot tub. Hot springs are just as beneficial for easing your muscles as a hot tub or warm bath. If you get the chance, it’s definitely worth taking your Alaska car rental out to one of these springs. Don’t bother traveling too far to get to a hot spring when you stay at Chena Hot Springs Resort. In use since 1905, the temperature of this hot spring rests at a constant 153 degrees Fahrenheit. 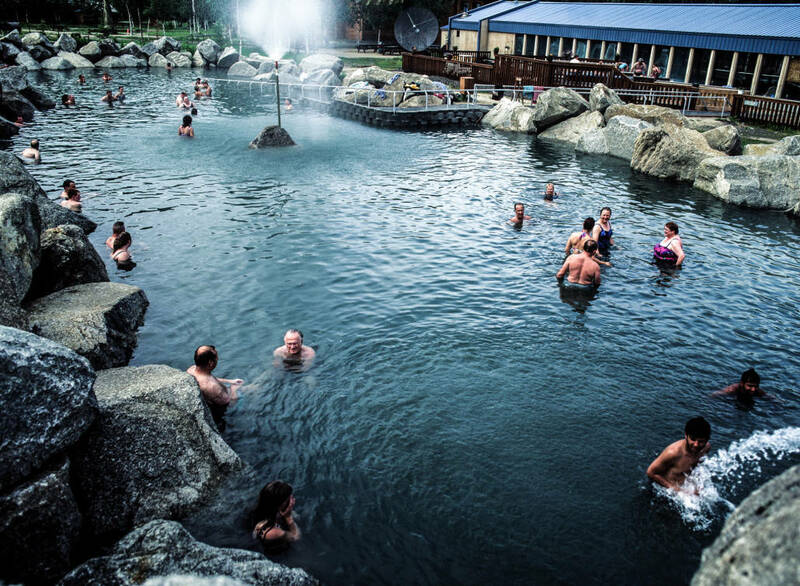 Originally used by gold prospectors, now anyone can enjoy Chena hot springs. Discovered by a U.S. Geological Survey team in 1911, the Melozi Hot Springs rests at 131 degrees Fahrenheit. The site has approximately 20 springs on Hot Springs Creek. The location is 30 miles northeast of Ruby, and is home to a private fly-in lodge. To call for a spot in the lodge, the number is (907) 892-6987. At a whopping 153 degrees Fahrenheit, the Goddard Hot Springs can be found on the Hot Springs Bay coast of Baranof Island. Just 16 miles south of Sitka, this is a quick drive in your Alaska car rental. Goddard was one of the first mineral springs discovered by the Europeans and enjoyed for its healing purposes. At a temperate 133 degrees Fahrenheit, Manley Hot Springs has a mere 77-person population as a nice escape from urban areas. The springs aren’t out in the open, and require you to call in advance to make sure you can get in. The springs are located inside a greenhouse, and many visitors of these springs donate to the site. For a unique experience, check out Trocadero Soda Springs. Trocadero is less popular than the other springs in Alaska, with carbonated soda waters rather than still, flat water. You’ll get a nice break from more heavily populated areas of Alaskan urban centers. Situated 12 miles southeast of Craig on the west coast of Prince of Wales Island, you’ll need to park the Alaska car rental and take a boat. With salmon and bears in abundance, make sure you keep a watchful eye during salmon spawning season. These certainly aren’t the only hot springs in Alaska. Other hot springs include Horner Hot Springs at 117 degrees, Clear Creek Hot Springs at 148 degrees, Bell Island Hot Springs that varies from 125 to 175 degrees, Kanuti River Hot Springs at 151 degrees, Dall Hot Springs at 129 degrees, and Kilo Hot Springs at 122 degrees. Finally, Shelokum Hot Springs comes in at a whopping 198 degrees Fahrenheit. After driving around the state in your Alaska car rental, you’ll likely want a nice escape from sitting in a car. Enjoy the hot springs of Alaska. © Copyright 2016 | Alaska Rent a Car Inc.